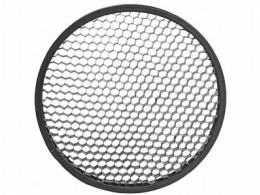 The 60° Honeycomb Grid clips into the end of a standard 7” reflector. Honeycombs are used to narrow down the spread of light by channeling the light into a defined beam, creating a very dramatic and intimate effect. This precise direction of light limits the amount of light that spills onto your background. The smaller the angle of grid, the more defined your light becomes.